The book is available in Black and White, Colour and also for the Kindle. I opted for the full fat colour version which I ordered from the USA as it wasn't available in the UK. The full colour version doesn't disappoint due to the sheer amount of diagrams used to explain some of the concepts. Chapters 1 through 9 go through vSphere High Availability (HA) and also go in depth over the changes in HA with vSphere 5. No longer do we have the concept of primary and secondary nodes and the issues that can arise in the event of losing all primary nodes. vSphere 5 HA was completely re-written and uses FDM (Fault Domain Manager) which has the concept of master and slave nodes within a cluster. The book also goes in depth about the new HA datastore heartbeat which can be used in the event of loss of the management network. HA is one of those features that people take for granted since it can pretty much be configured with a few clicks and "just works". 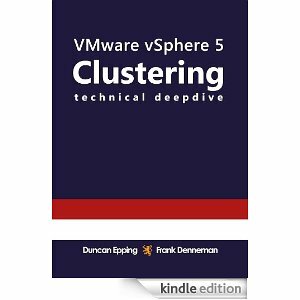 These chapters go into the inner workings of HA and are a must for anyone designing vSphere environments. Chapters 10 through 19 go in depth, and I mean really in depth, in the changes to Distributed Resource Scheduler DRS within vSphere 5. Once again, DRS is one of those technologies than can be enabled with a few clicks and pretty much forgotten about. These chapters explain every inch of DRS and how it goes about making the decisions that ultimately affect where a VM is migrated or a host is powered down to save power consumption. Some of the concepts can be quite difficult to follow but nearly all discussions are followed up with flow diagrams that further explain the theory. I found myself having a read some sections a couple of times to let the information sink in and then the flow diagrams reinforced it. Chapters 20 through to 26 explain about the new vSphere Storage DRS (SDRS). This is a new feature in vSphere 5 that allows monitoring of datastores for disk space and disk latency and either make recommendations or, in automatic mode, perform the actual recommendation. SDRS will ensure all datastores are load balanced for disk IO and space as best it can whilst also taking into consideration any affinity or anti affinity rules you have. The chapters explain all setting (including advanced) that you have at your disposal and how certain decisions can affect others. Once again, the guys have produced an excellent technical resource that just shows that HA, DRS and SDRS are extremely useful and advanced features of vSphere that all production environments should utilize.